Sometimes, the evidence of an insect's presence may be much more visible than the insect itself. Imagine passing by a common juniper tree Juniperus communis and seeing a structure like the one in the photo above (copyright Jean-Yves Baugnée). You might think it was some sort of reproductive structure. You would be right, though it is not the tree that is reproducing. This is the gall of a juniper gall midge Oligotrophus juniperinus, and were you to cut the gall in half you would possibly find a single gall midge larva lurking within. Many insects (and other animals) cause the development of galls on their host plants, thus providing themselves with both shelter and food in one convenient location. Male Oligotrophus betheli, from Simova-Tošić et al. (2010). 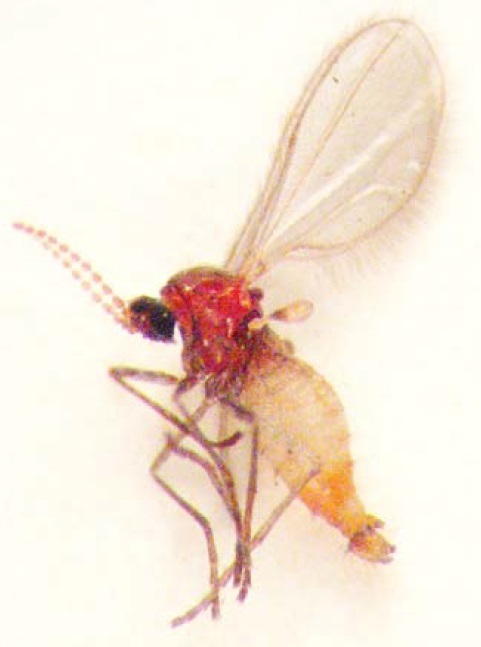 The adult gall midge is a minute, very delicate fly, unlikely to be spotted by the casual observer. Gall midges are classified in the family Cecidomyiidae, an extremely diverse group of which not all members cause galls as larvae (some feed on plants without causing galls, others feed on fungi, a few are even predators or parasitoids). Cecidomyiids are divided between a number of subfamilies and tribes, with Oligotrophus belonging to the tribe Oligotrophini. In the past, this tribe has been used to cover a heterogeneous mix of relatively unspecialised cecidomyiids, but the most recent classification of the tribe strips it down to two genera, Oligotrophus and Walshomyia, found in the Holarctic region (Harris et al. 2006). Adults of these genera have legs with simple tarsal claws and long empodia (the soft pads between the claws), and as larvae they all live in galls on trees of the cypress family Cupressaceae. The exact form of the gall produced may differ between species, and it is often (though not always) possible to determine the species responsible for a gall by its form. For instance, three species that cause galls on Juniperus communis in Europe are Oligotrophus juniperinus, O. panteli and O. gemmarum. 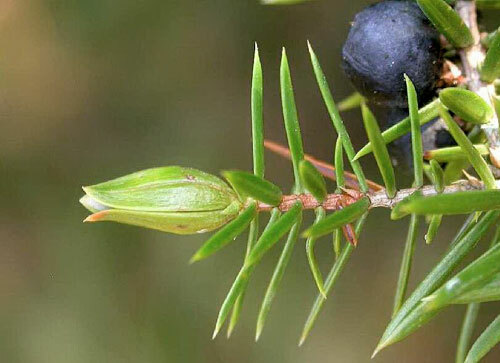 The first two species have galls formed from whorls of leaves pressed into a vase shape, but whereas in galls of O. juniperinus the leaves splay outwards towards the tip, in galls of O. panteli they remain parallel. The third species, O. gemmarum, has much smaller galls formed from only slightly modified buds; though very different from mature galls of the other two species, they may be confused with young undeveloped galls (Harris et al. 2006). Despite their diversity, and the fact that some species are economically significant to humans, cecidomyiids are not a widely studied group. Part of the reason for this is that their small size and build makes them difficult to handle; diagnostic work on adults often requires slide-mounting them. I have made one not-very-successful attempt at slide-mounting cecidomyiids, and I can confirm that it is a fiddly process. Because the different body parts often have to be examined from different angles, slide-mounting first requires dissection of the animal into sections (so, for instance, the head can be placed on the slide face-on, the body side-on, and the terminalia top-up). In my experience, instructions for slide-mounting animals requiring such dissections will always tell you to arrange the various bits appropriately on the cover-slip before placing the slide (or the other way around, if you prefer). And if you know how to attach slide to cover-slip without having all your carefully arranged body parts immediately zooming off to a completely different spot on the slide from where you put them, then you're a far more skillful slide preparer than I am. Harris, K. M., S. Sato, N. Uechi & J. Yukawa. 2006. Redefinition of Oligotrophus (Diptera: Cecidomyiidae) based on morphological and molecular attributes of species from galls on Juniperus (Cupressaceae) in Britain and Japan. Entomological Science 9: 411–421. Simova-Tošić, D., D. Graora, R. Spasić & D. Smiljanić. 2010. Oligotrophus betheli Felt (Diptera: Cecidomyiidae), a new species in the fauna of Europe. Arch. Biol. Sci. 62 (4): 1219–1221. I greatly enjoy your blog. I have, however, one suggestion for improvement: sizes. You say in this post that adult gall midges are "minute": how minute? And in general, I think I would like some bit of scale information with the photos of a lot of the (many, many) taxa you cover that I am not familiar with. I guess that counts as a complaint, but don't get the wrong idea: I enjoy your blog ANYWAY, and am grateful to you for the time you put into producing posts. Happy New Year! I'll keep your comment in mind. In this case, the midge in the photo of the adult male is a bit under two millimetres in total length. I was under the impression that when slide mounting multiple bits on the cover slip, you let the cover slip dry before you place it on the slide with another drop of mounting medium. That way the bits won't shift. Alternatively, when I was at the British Museum (Natural History) last summer, I saw one researcher using individual tiny cover slips for each part. Part-drying the slide sounds like a good idea; I might have to try that some time. Using micro-cover slips, though, sounds a bit fiddly, plus I wonder how that affects long-term survival.